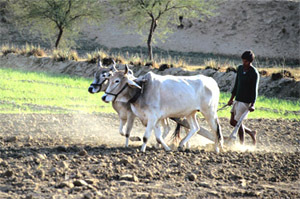 Though Indian economy is growing by leaps and bounds, agriculture still remains its Achilles heel. There is a wide disparity between the producer and consumer. Farming has largely become an un-remunerative occupation. However success we may achieve, the ground reality remains that India has failed to bring its farmers to the mainstream. Sad to say, but we have become oblivious of our villages. Can we expect a booming economy without inclusion of agriculture? In fact , this is one of the reasons why India is still a developing nation. The condition has worsened to such an extent that nobody likes to pursue farming.The NSSO estimates that 40% farmers would like to quit farming if they had the option to do so. There are a plethora of reasons for this widespread deprivation and disenchantment. Low public investment, inadequate irrigation facilities, fragmented land holdings, low technology application and farmers debt have spelt doom for this sector that is supposed to be the lifeline of our economy. Prime Minister Manmohan Singh acknowledges that a double digit growth would forever elude India without a dramatic turnaroud of the rural landscape. Govt investment in agriculture has fallen from 14.9% in the first five-year plan to 5.2% in the current plan. Whatever substantial is allotted for the farmers becomes the morsel of our corrupt politicians. One of the reasons for backwardness of Indian agriculture is its dependence on monsoons which are largely erratic in nature. Currently only 40% of the land under cultivation is irrigated and a large number of river-valley projects have failed to meet their deadlines. The problem of fragmented land'holdings makes it inept for the use of modern machines and techniques. The year 2006 was agog with news of farmers suicides in various parts of the country. Farm input costs continue to rise but the output prices remain stagnant; debts are mounting but support systems are nowhere to be seen .Lack of institutional credit is the major cause of rising debts among farmers. As a result marginal farmers turn to private money-lenders for loans at interest rates anywhere between 40 to 120% p.a. to purchase seeds, fetilizers and other agricultural inputs. M.S Swaminathan's recommendation that India needs to bridge the knowledge deficit in its farm sector is well received by the planning and policy circles .There is an urgent need for investment in R&D in agriculture. India spends 0.31% of its GDP on R&D which is far below industrialized nations. Agricultural institutions like ICAR and CRRI should be revamped according to present day needs. The UPA govt's current aim is to raise the agricultural growth rate to 4% from a worrisome 1%.It's not that Govt has been a mute spectator all these years. Whatever self-sufficiency we have achieved in food-grain production is because of the prudent measure by past Govts. India's stand at WTO is a matter of pride for all developing countries of the world. Indian agriculture is in a quandary. The acquisition of farm land for industrial purposes has opened can of worms for farmers. The ideal step would be use of barren land, proper compensation,&industry-farmer partnership. India certainly needs a second green Revolution and to usher that we will have to look back at the first green revolution model which involved collaboration between central and state governments, agricultural universities and research institutions.